We first consider a tax levied on buyers of a good. Suppose, for instance, that our local government passes a law requiring buyers of ice-cream cones to send $0.50 to the government for each ice-cream cone they buy. How does this law affect the buyers and sellers of ice cream? 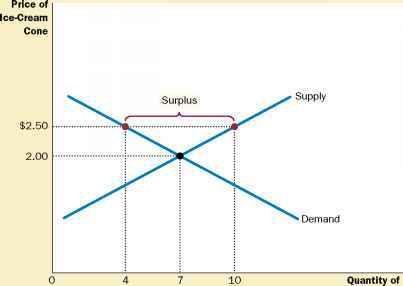 To answer this question, we can follow the three steps in Chapter 4 for analyzing supply and demand: (1) We decide whether the law affects the supply curve or demand curve. (2) We decide which way the curve shifts. (3) We examine how the shift affects the equilibrium. The initial impact of the tax is on the demand for ice cream. The supply curve is not affected because, for any given price of ice cream, sellers have the same incentive to provide ice cream to the market. By contrast, buyers now have to pay a tax to the government (as well as the price to the sellers) whenever they buy ice cream. Thus, the tax shifts the demand curve for ice cream. The direction of the shift is easy to determine. Because the tax on buyers makes buying ice cream less attractive, buyers demand a smaller quantity of ice cream at every price. As a result, the demand curve shifts to the left (or, equiva-lently, downward), as shown in Figure 6-6. A Tax on Buyers. When a tax of $0.50 is levied on buyers, the demand curve shifts down by $0.50 from D1 to D2. The equilibrium quantity falls from 100 to 90 cones. The price that sellers receive falls from $3.00 to $2.80. The price that buyers pay (including the tax) rises from $3.00 to $3.30. Even though the tax is levied on buyers, buyers and sellers share the burden of the tax. We can, in this case, be precise about how much the curve shifts. Because of the $0.50 tax levied on buyers, the effective price to buyers is now $0.50 higher than the market price. For example, if the market price of a cone happened to be $2.00, the effective price to buyers would be $2.50. Because buyers look at their total cost including the tax, they demand a quantity of ice cream as if the market price were $0.50 higher than it actually is. In other words, to induce buyers to demand any given quantity, the market price must now be $0.50 lower to make up for the effect of the tax. Thus, the tax shifts the demand curve downward from D1 to D2 by exactly the size of the tax ($0.50). 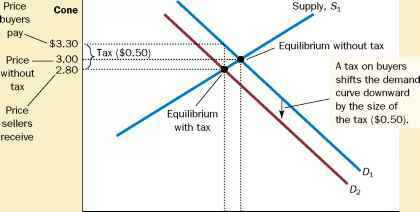 To see the effect of the tax, we compare the old equilibrium and the new equilibrium. You can see in the figure that the equilibrium price of ice cream falls from $3.00 to $2.80 and the equilibrium quantity falls from 100 to 90 cones. Because sellers sell less and buyers buy less in the new equilibrium, the tax on ice cream reduces the size of the ice-cream market. ♦ Taxes discourage market activity. When a good is taxed, the quantity of the good sold is smaller in the new equilibrium. ♦ Buyers and sellers share the burden of taxes. In the new equilibrium, buyers pay more for the good, and sellers receive less. When a tax is levied on a good, the buyers and sellers of the good share the burden? How tax on buyer affect market outcome? How tax on buyers affect market outcome? How taxes on sellers and buyers affect market outcomes? How taxes on buyers affects market outcomes? How taxes on buyers affect market outcomes questions?